Sharjah Airport International Free Zone, SAIF Zone, has announced that Korea-based global company Kiswire and the UAE-based Amzone International Ltd. will jointly open a 220,000 square-feet marketing and sales complex in SAIF Zone by the first quarter of 2017. “The new facility’s management philosophy will be based on responsibility and mutual respect. We choose to associate with brands who share our idea in lifting technology and engineering innovation. We have an exclusive partnership with Kiswire, the world’s largest high carbon wire & wire rope producer, for the past 26 years,” said M.G. Saif After the ground breaking ceremony, Al Mazrouei held discussions with K.C. Hong and M.G.Saif. Al Mazrouei noted that a number of new companies have been opening in SAIF Zone due to its strategic position and attractive offers and facilities. “SAIF Zone has extended extensive support to launch the project and the complex will be operational by the first quarter of 2017. 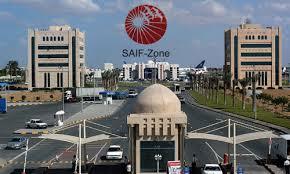 SAIF Zone is at a strategic location and the new complex will provide us easy access to the Asian, African and Middle Eastern market,” added M.G. Saif.